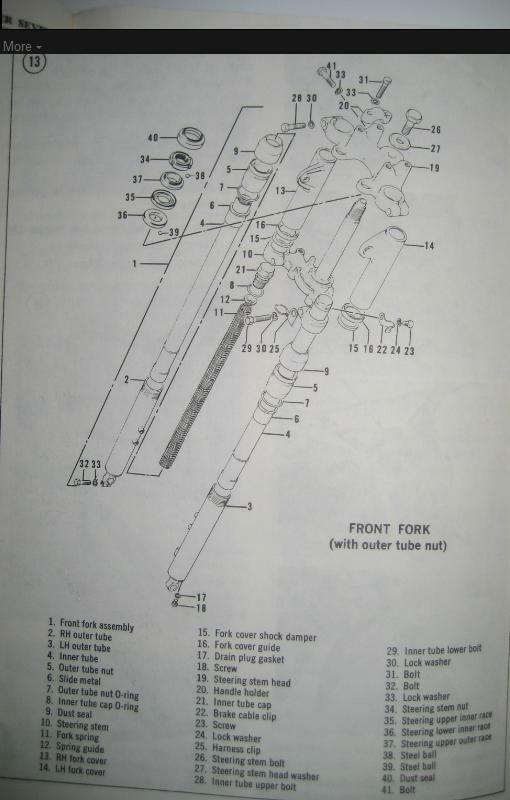 Two basic types of tube forks are used. Figure 13 illustrates the first type and Figure 14 illustrates the second type. 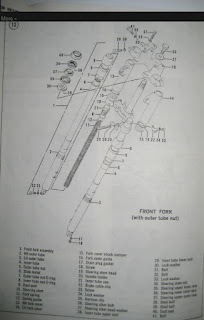 The first type is distinguished from the first type by the presence of the outer tube nut (5, Figure 13) which must be removed to disassemble the forks. The second type does not have the outer tube nut but has a cylinder retaining bold in the bottom of each fork leg. 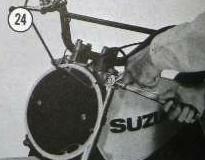 To disassemble the first time with the outer tube nut, perform Step 1. To disassemble the second time, proceed to Step 2.
a. 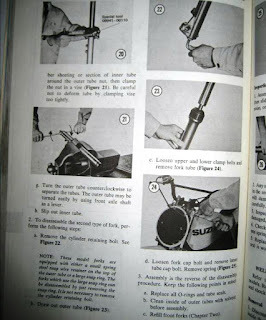 Remove fork tube head bolt. (Figure 15). b. 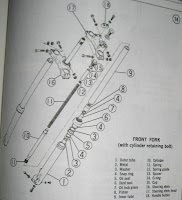 Remove spring guide (Figure 16). 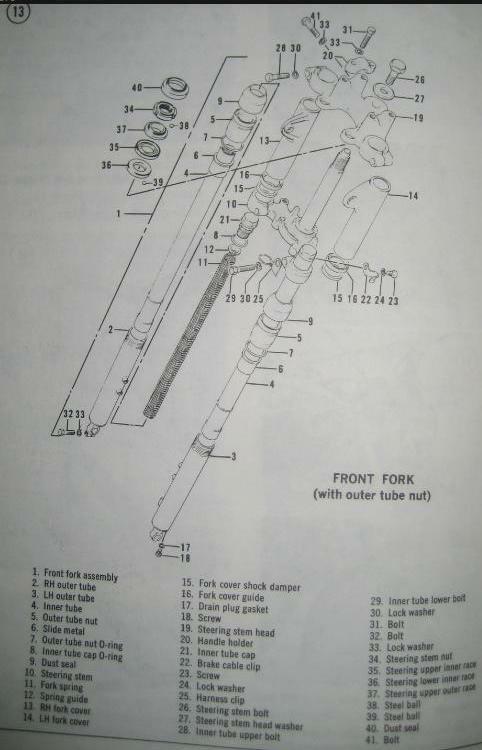 c. Remove fork spring (Figure 17). d. Invert the fork tube, and drain the oil (Figure 18). Discard the drained oil. 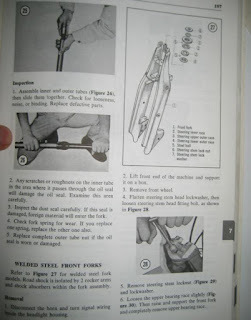 f. Hold outer tube bracket, then remove outer tube nut (Figure 20). 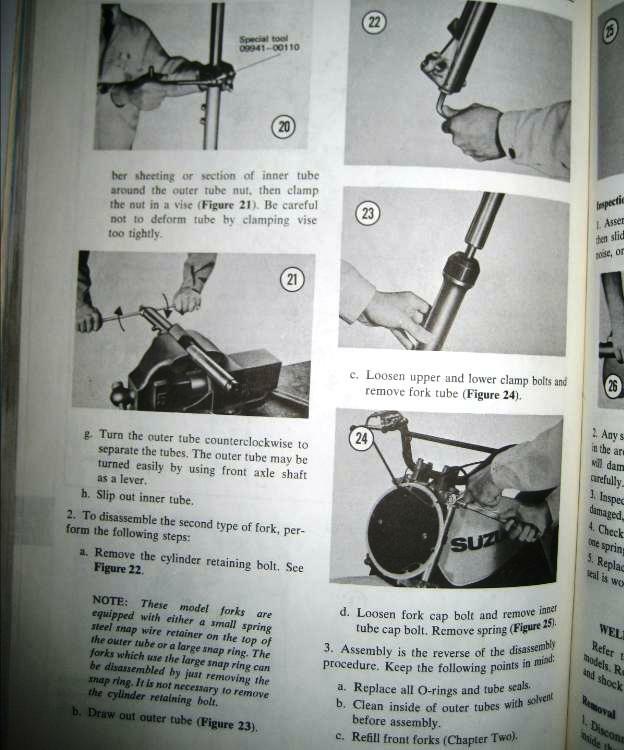 If the special tool is not available, wrap a piece of rubber sheeting or section of the inner tube around the outer tube nut, then clamp the nut in a vise (Figure 21). Be careful not to deform the tube by clamping the vise too tightly. 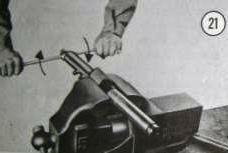 g. Turn the outer tube counterclockwise to separate the tubes. The outer tube may be turned easily by using the front axle shaft as a lever. h. Slip out inner tube. a. 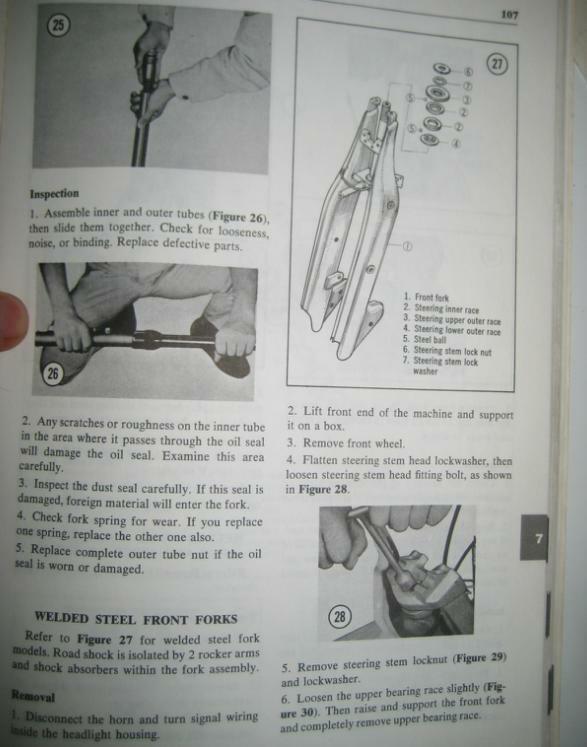 Remove the cylinder retaining bolt. See Figure 22. NOTE: These model forks are equipped with either a small spring steel snap wire retainer on the top of the outer tube or a large snap ring. The forks which use the large snap ring can be disassembled by just removing the snap ring. It is not necessary to remove the cylinder retaining bolt. b. Draw out outer tube (Figure 23). 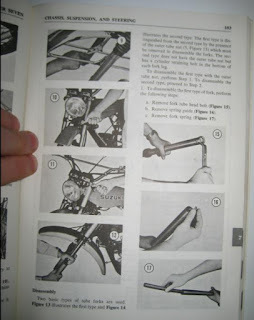 c. Loosen upper and lower clamp bolts and remove fork tube (Figure 24). 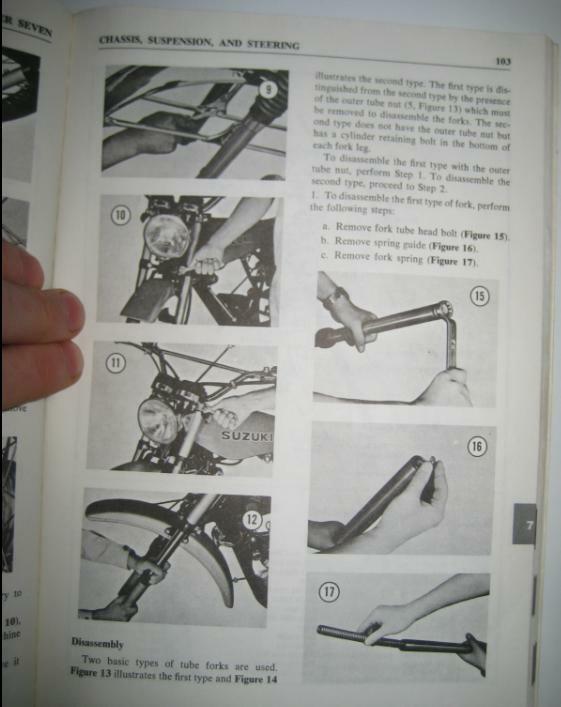 d. Loosen fork cap bolt and remove inner tube cap bolt. 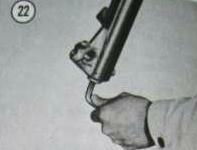 Remove spring (Figure 25). a. Replace all O-rings and tube seals. b. Clean inside of outer tubes with solvent before assembly. 1. 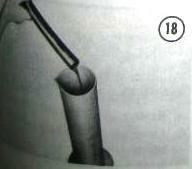 Aseemble inner and outer tubes (Figure 26) then slide them together. Check for looseness, noise, or binding. Replace defective parts. 2. 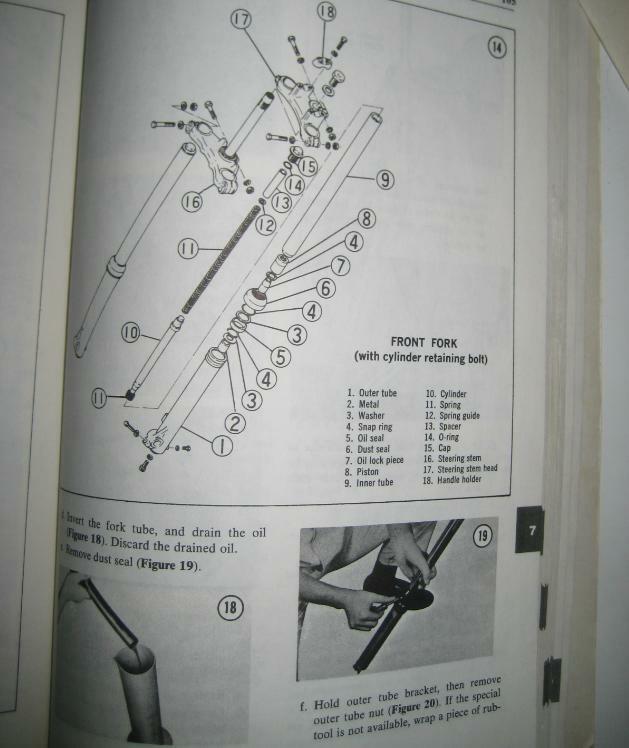 Any scratches or roughness on the inner tube in the area where it passes through the oil seal will damage the oil seal. Examine this area carefully. 3. Inspect the dust seal carefully. If this seal is damaged, foreign material will enter the fork. 4. 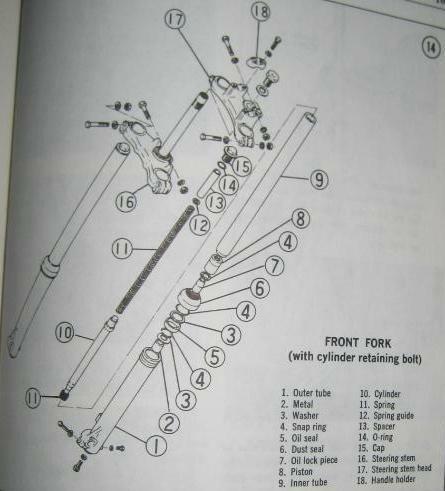 Check fork spring for weark. If you replace one spring, replace the other one also. 5. Replace complete outer tube nut if the oil seal is worn or damaged. 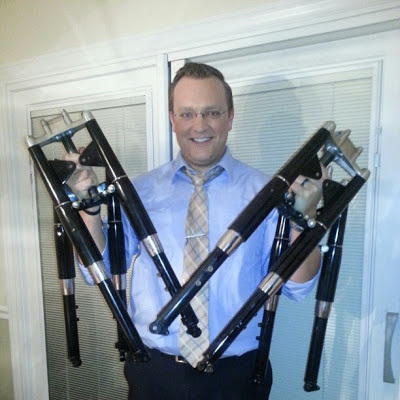 dude hook me up with one of those k10 forks! mtbmarkp@gmail.com/sabatiantettenhorste on unOHfficials group.